Century A/C Supply Why Buy Ruud? Why Gulf Coast Texas Customers are Choosing Ruud for Reliability with their Air Conditioning and Heating Systems. Meet Ruud, manufacturers of quality HVAC equipment distributed by Century A/C. Ruud air conditioning and heating equipment is available in the Houston metro area and across the Gulf Coast Texas region including the Katy, Humble, and Conroe areas. Houston air conditioning demands can be high, but Ruud is there to meet local HVAC needs. Ruud is a brand known around the world as well as Texas, upholding a reputation for reliable, efficient, and quiet air conditioning and heating equipment. Ruud has won the coveted "Most Efficient" award from Energy Star every year since the award's inception in 2011. Residential customers living in warm and dry country climates such as Lufkin, Humble, and Angleton can rest assured that when you invest in a Ruud HVAC air conditioning system, you're giving yourself peace of mind for years to come. Ruud is also a top choice for Century’s customers closer to the Gulf Coast, such as Bay City and League City. No matter your humidity level and local climate challenges, Ruud will keep your home or business comfortable, even in the extreme Texas temperatures. Ruud continues to lead the industry in quality and reliability by promoting a culture of continual improvement and having a commitment to exceeding customer expectations. Additionally, Ruud air conditioning products are frequently tested and certified by a multitude of government and third-party testing labs to ensure quality standards. 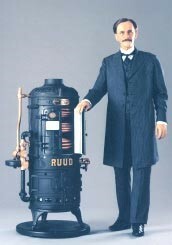 Brief History: Over 100 years ago, a Norwegian mechanical engineer named Edwin Ruud came to America and developed the nation’s first successful automatic water heater. His early success marked the beginning of a tradition of innovation and value that led to the introduction of Ruud heating and air conditioning equipment in the 1950s. Ruud is now one of North America's largest manufacturers of quality heating, cooling, and water heating products built specifically to provide comfortable, energy-efficient homes to American families.